Some years back, The Economist named Hank Hill (famed propane salesman of TV’s animated series King of the Hill) as one of the wisest men on TV. 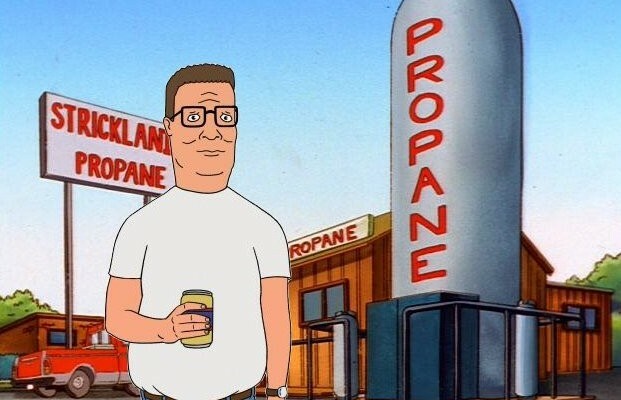 While the honor was generally based on Hank’s no-nonsense assessment of the political environment, it goes without saying that Hank’s never-ending quest to sell “propane and propane accessories” is still going strong. If you grew up in a rural environment like I did, propane was a way of life for heating, cooking, etc. Today, as urban and suburban populations swell, many of us only recognize propane as the fuel for our outdoor grills. But it only takes traveling slightly beyond the fringe of suburban society to enter back into the world of propane. While almost 85% of households in the United States heat with natural gas or electricity, more than 10% rely on heating oil or propane. For truly rural environments like farms, nearly three quarters of a million farmers use propane for irrigation pumps, grain dryers, standby generators and other farm equipment. It’s an essential fuel for crop drying, flame cultivation, fruit ripening, space and water heating and food refrigeration. Propane is also a contender in the “green power” transportation movement, with many businesses and civic entities choosing this clean-burning fuel for bus, taxi, delivery, and other fleets to minimize air pollution in metropolitan areas. Beyond rural farms and the backyards of homeowners, propane is in high demand outside the borders of the US where infrastructure for natural gas, or sometimes even electricity, are lacking. So it wasn’t surprising to see the latest EIA report showing that propane exports increased 75% to 130,000 barrels per day in 2013, averaging 300,000 b/d for the year, with almost half of the total going to Central and South America. Exports to Europe also doubled from 2012 levels to 55,000 b/d. According to the EIA report, increases in propane production (note that propane is a byproduct of natural gas production) and the associated elevated inventories contributed to the growth in propane exports. Additionally, 2013 US propane production increased 110,000 b/d compared with 2012, while consumption grew 90,000 b/d. Beyond Central and South America, the US is also seeing growth in propane production to meet the intense demand from Asian importers for more U.S. propane exports. However, not all the news is good for users of propane. High demand in some parts of the US for propane to deal with an unusually cold 2013-2014 winter caused propane prices to increase over a dollar a gallon more than typical prices, hitting many rural users in the pocket book. It was enough of an issue for governmental entities to call for curbing exports to satisfy demand in the US. While the comparison of the recent propane export issue as compared to proposed natural gas exportation concerns may not be apple to apple, it certainly gave a somewhat real-time reality check on how to evaluate our natural gas (and natural gas derivatives like propane) exportation plans and policies. Additionally, there is concern about ethane surpluses and what that will mean for propane prices. A recent note from the OPIS Propane Daily gives warning to the ethane glut, and the headlong rush into more ethane development.